Sheriff To Texas Border Town: 'Arm Yourselves' The murder of a rancher in southeastern Arizona last month has fueled fears that escalating drug violence in Mexico will spill into the U.S. It prompted a Texas sheriff to send the chilling warning to farmers gathered at a town-hall meeting in Fort Hancock. As he put it, "It's better to be tried by 12 than carried by six." A U.S. Border Patrol agent parks beside the border fence at Fort Hancock, Texas. With fears rising that the drug violence in Mexico could spill into the U.S., Hudspeth County Sheriff Arvin West said at a town-hall meeting last week: "You farmers, I'm telling you right now, arm yourselves." Along the border, fears are growing that the escalating drug violence in Mexico will spill into the United States. Last month, a well-known rancher was murdered in southeastern Arizona. Authorities suspect an illegal immigrant did it. The murder prompted governors in New Mexico and Texas to send forces to the border. This week, the Mexican government sent dozens of police and soldiers to the Juarez Valley to restore order. For many on both sides of the border, the fear is very real. Last week, residents held a town-hall meeting in Fort Hancock, Texas — a sleepy agricultural town on the border, about an hour southeast of El Paso, that looks like the bleak set of No Country for Old Men. A couple hundred people crowded into the grade-school gym to hear a chilling message from Hudspeth County Sheriff Arvin West. "You farmers, I'm telling you right now, arm yourselves," he said. "As they say the old story is, it's better to be tried by 12 than carried by six. Damn it, I don't want to see six people carrying you." You farmers, I'm telling you right now, arm yourselves. As they say the old story is, it's better to be tried by 12 than carried by six. Damn it, I don't want to see six people carrying you. His warning was prompted by the killing of the Arizona rancher, and the spiraling violence a couple of miles away in Mexico in a region known as the Valley of Juarez. The notorious smuggling territory is being fought over by the Sinaloa and the Juarez cartels. "One of the men that works for me had five people killed in front of his house over there [in Mexico] this past weekend," says Curtis Carr, who is a farmer and county commissioner. "And he's moving his family over here this week. It's serious over there. Whether or not it's gonna spill over here, I don't know." The sheriff warned citizens to be alert and report strange vehicles on their streets. But at the same time, he said, don't succumb to fear. "We haven't had anybody kidnapped here yet, but it could come," he said. "We haven't had anybody killed here, but that could come." The violence in the Juarez Valley directly affects this little Texas town. A couple of weeks ago, gunmen in the Juarez Valley killed the Mexican relative of a Fort Hancock high school student. When the student's family in Fort Hancock heard about it, they crossed the border at 10 a.m. to see the body, and took the student with them. "By 10:30, they had stabbed the relatives that went with him, which included his grandparents, with an ice pick," says school superintendent Jose Franco. "My understanding is that the gentleman is like 90 years old, and they poked his eyes out with an ice pick. I believe those people are still in intensive care here in a hospital in the U.S."
Franco says the boy has isolated himself from other students so they won't ask him about the gruesome attack that he witnessed. The Valley of Juarez has a long history of human and drug trafficking. There's lots of open farmland for illicit activity. It's close to the city of Juarez, a major smuggling point. It's right across from Texas, with Interstate 10 only a few miles to the north. And the river, the Rio Grande, is no deterrent. Veteran Border Patrol agent Joe Romero stands on a levee overlooking the international river — which this time of year is but a trickle. "You can literally walk across the river — and some times of the year not even get wet," he says. "And with the ease with which you can literally cross the border here from one side to the other, this made it very lucrative and appealing to anybody trying to smuggle in whatever contraband they had." 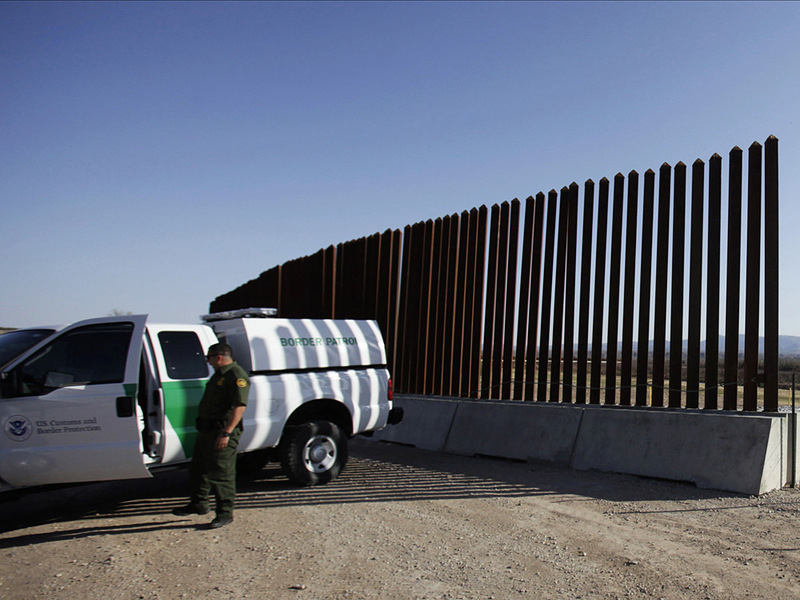 In recent years, the Department of Homeland Security has put up 44 miles of tall fencing across from the Juarez Valley, and doubled the number of Border Patrol agents. As a result, marijuana seizures in this area have fallen 97 percent in the past four years. But none of this has dampened the drug mafias' vicious competition to dominate the Juarez Valley. Esperanza is one of several farm towns in the Juarez Valley terrorized by the narco-war. Last week, traffickers are believed to have torched two houses there and killed the occupant of one. A large bloodstain on the back door of one house marks the spot where the owner was executed. More than 50 people were killed in the Juarez Valley in March. Arson and murder are the tactics being used to drive out rival traffickers, as well as the general population. Along a highway, eight members of the Villareal family stand, their bags packed, waiting for the bus. They say they're all afraid because of the killings. There's no security, no work anymore, and farmers have abandoned their fields. You know it's bad when people are fleeing for safety to Juarez — the most murderous city in the hemisphere.